Feeding baby on time is priority for all parents. With Mee Mee's range of premium quality feeding bottles you can now feed your baby on time, anywhere you go. 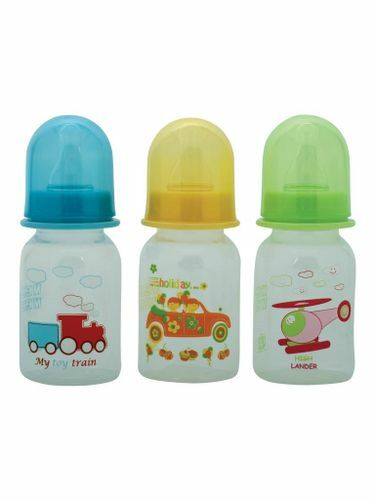 Easy to carry and clean, these bottles meet Bureau of Indian Standards and highly convenient to use. As babies learn to drink from bottles, they grow more independent with time. Complies with EN, BIS & ISI norms. All parts are made from non-toxic, BPA free food grade polypropylene plastic. Enables to give expressed breast milk or prepared infant formula to your baby, whenever breast feeding is not possible. Convenient to use, carry & sterilize. Bottle can be easily carried in diaper bag, Mee Mee Bottle Carrier and clipped on the side of Mee Mee Baby Carrier.